All Trips Guaranteed to Catch Fish! The most beautiful time of year has yet to come to the high country of Colorado, unless you like massive drifts of seriously decadent powder. We are in the midst of an epic mountain snow storm right now, so much so, that even some of the local ski areas have been forced to close due to avalanche danger. What a fabulous time to be alive! The runoff is going to be epic and now is the time to get ready. Spring in Colorado is a magical time and the fishing is epic. Think of it, where else can you wade some of the finest trout streams in the country one morning and start off the next making powder turns at one of the local resorts? The time is now, to give the guides at Kirk’s Flyshop in Estes Park a call. The spring season is filling up fast and due to the sheer amount of snow, it is shaping up to be an epic year. Whether you would like to fish private waters, experience a rugged overnight backcountry fly fishing adventure or simply chasing trophy Browns on the Colorado, Kirk’s has the experience for you. Our professional guides are some of the best in the area and have exceptional knowledge of the waters. When you book a trip from Kirk’s Flyshop the only thing that you need to bring is your desire to catch fish. We provide everything, unless of course you are itching to test out your new Sage ACCEL that Santa left under the tree. You may want to leave your fly box at home however because we have a wide selection of locally tied flies that have been tested on the water with exceptional results. Our flies are custom made for the local waters and will produce results we offer a full range of packages for our local waters check out our selection here. On the subject of flies, we are currently stocked up on all of the flies you will need for fishing this spring. With all of the snow we have received in the high country, the water is bound to be raging this spring. This can be a challenge when trying to get the rainbows to bite. The runoff will bring all sorts of food to the trout hiding in the dirty water. The chance to delicately float a mayfly pattern on the surface will still be a few weeks off when the runoff is on full blast. Your best bet is the old tried and true wooly bugger. A muddler minnow is a good choice in these waters as well. That being said, the wooly bugger and muddler are exceptional year round favorites to keep in your fly box. 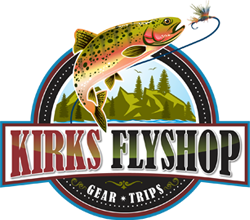 Now is the time to stock up for spring, whether that means a new pair of waders or a handful of Rocky Mountain National Park flies, Kirk’s Flyshop has you covered. Don’t forget, book your trout fishing adventure now before all of the prime days are gone!